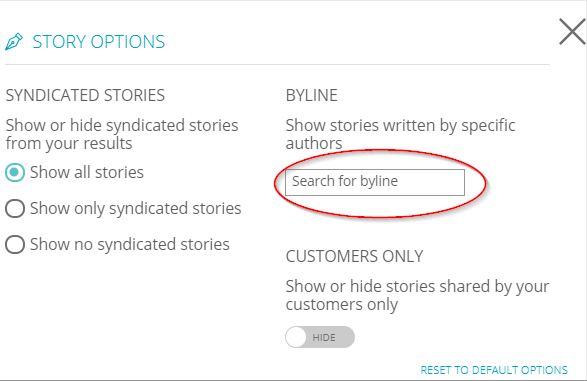 You can display content written by an individual journalist by searching for their name in the Byline search field. This search field is located within the Advanced Filtering Panel which you can access by clicking "More Filters" in the top menu bar. The Byline search field is on the right hand side of the filtering panel. To reset to the default view, you can either delete the byline search field contents and press enter, or press the "RESET TO DEFAULT OPTIONS" link found at the bottom right of the Advanced Filtering Panel.